Other media outlets reported that Sayoc was a great admirer of Hitler. These attributes pretty much describe all of Trump’s supporters. “Unsophisticated” doesn’t mean merely that Trumpites never got very far in school (although many if not most didn’t), nor does it mean they all live in trailer parks or in their vans (although many, including Sayoc, did and do). It means they lack what we call “wisdom.” The root word of “sophisticated,” the Greek sophos, means wise. But what does “wise” mean in our complex, fractured society? Wisdom is true knowledge, based upon the close examination of self and life. All else is evil ignorance. Burke, too, was an elitist, as were all America’s Founding Fathers. America used to celebrate its elite: they possessed the knowledge, wisdom and vision to create grand institutions, including the grandest of all: The United States of America. These days, with the rise of a know-nothing class in the Republican Party, elites are hated (and envied). The Republican-Trumpite right wing glories in what they think of as the simple, manly virtues: formal education, they argue, only stagnates the mind and corrupts the natural instincts. Instinct, they allege, is a surer guide to living the good life than analytical thinking, which they view as a sort of evolutionary aberration from which strong men do not suffer. And now, consider Sayoc. Certainly this was a man who did not overthink anything. Whether he “thought” at all, as we commonly understand the verb, is questionable. Information disappeared in inside him, and out came violence. What transpired in between? God only knows, except that it cannot have been rational, or “good” as Socrates understood the good, for if it were good, Sayoc would not have succumbed to the cult of Donald Trump and tried to assassinate Democrats. In Sayoc we see “the unexamined life” reach its awful peak (or perhaps “nadir” is more accurate). This was a man who did not examine himself, his motives, his conclusions, or the truth or untruth of what his Leader claimed. Perhaps he could not, because he was mentally deranged. 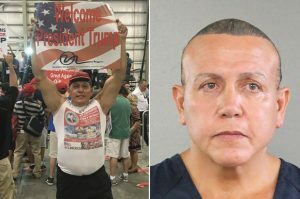 What we can say is that Sayoc represented the worst dregs of American culture, a truly deplorable and reprehensible human being; we are much better off that he will never see the light of day outside a prison cell. Harsh words, yes, but true. Socrates would have understood; Edmund Burke would have understood. There is something horribly degraded in Republican minds: an absence of intelligence, of “sophistication,” of morality, of “heart,” “unable to govern themselves.” I don’t believe they constitute the majority of our population, but they are a sizable minority, and like any diseased population that represents a threat to the healthy majority, they need to be quarantined, to keep the plague from spreading. How do we quarantine them? We can’t do it physically, obviously. Nor can we shut them out of public discourse, for there will always be disease vectors, like Fox “News,” that spread the germs throughout the general population. But what we can do is to isolate those malignant voices by calling them out for what they are—evil. We can confront them when they lie, oppose them when they march, sue them when they defame, defend ourselves when they attack, and bring them into the Courts of Justice when they commit crimes, as we’re doing now with Sayoc. And the ultimate form of quarantining them is political: We can vote them out, at every level: local, town, county, district, state, so that they’re reduced to insignificant pustules of infection that can be controlled, as we control chronic diseases by medication, even if we can never fully eradicate them. So let “Sayoc” be the face of the Republican Party: psychotic, homicidal, infantile, diseased, evil, deplorable—a surrogate for the original germ itself, Patient Zero, the source and carrier of the infection: Donald J. Trump.